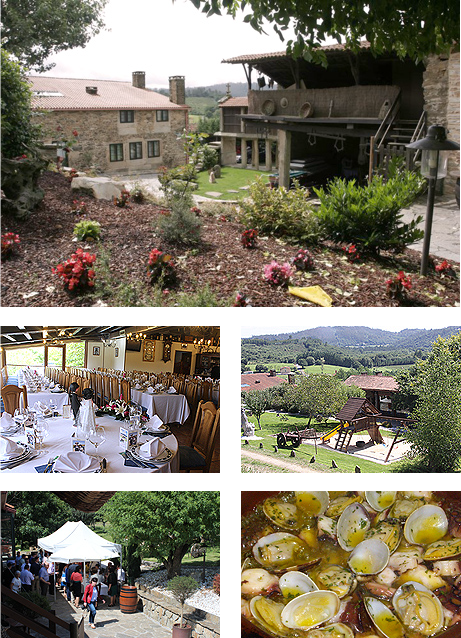 Founded in June 2001, Casa Rosinda is an excellent sample of the blend between tradition and gastronomy. The love for cooking and tradition brought its owner, Alberto González, to transform the farmhouse where he was born into a benchmark of good food and fine treatment. And all this in a natural setting of incomparable beauty, just a few kilometers away from Galicia’s capital, Santiago de Compostela. After two years of Incessant work and infinite illusion, the marriage formed by Alberto González and María Luz López transformed the original family house and its porches into both a museum and a restaurant, where diners experience tradition and welfare at the same time. It preserves the structures and materials of the original buildings, which were raised at the beginning of the 20th century. Casa Rosinda is inside and outside decorated with tillage tools and old pieces of craftsmanship typical of Galicia. Casa Rosinda represents a true delight for all senses. It is located in PONTE, a natural environment, 1500 meters from the river recreation area of CHAYÁN (Concello de Trazo), 5 kilometers away from Santiago de Compostela. In our surroundings, you can practice cycling, trekking, swimming, and fishing on the banks of river Tambre or simply give a walk.